A few years ago I completed 2 years out of a 3 year Bachelor of Arts degree and was planning to use that degree to go into a post-graduate degree to become a Primary School Teacher. For various reasons my university studies were put on hold and I worked in a few different jobs, never really finding my place in the working world or really feeling as though I’d found a career I wanted to pursue. In the second half of 2012 I was able to apply to return to university and complete my earlier studies. When I was going through the application process I was offered the chance to be accepted for almost any course I applied for as part of the university’s early offer program. This gift of a broader choice of courses to choose from forced me to sit down, look at what I really wanted out of a career and decide what I felt would challenge me, help me grow and prevent boredom creeping in as it so often had in the past. So after much thought and discussion with my fiancé (who is a primary school teacher) I decided that I loved the idea of becoming a nurse. I received the early offer into a Bachelor of Nursing and have begun to dive right back into the interesting world of university all over again. I have always known that I wanted to do the sort of work where you’re helping people, can feel a great deal of satisfaction in your work and will constantly be challenged. 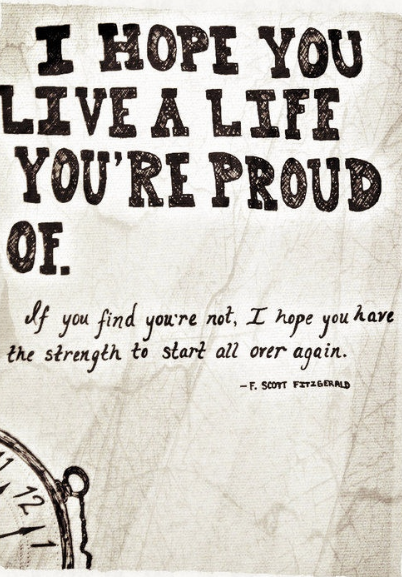 I have always wanted to ‘live a life I’m proud of’, as the quote below has reminded me. I know that nursing is definitely going to give me these opportunities and so many others too. With inspiration from family members and a few friends who are in the nursing profession I am able to gain invaluable advice. I’m grateful that I can use their experiences to help guide me and warn me about what to expect, realistically, as I train to become a nurse. I’ll be keeping this blog throughout my studies so that I can vent a little, share my experiences, keep a journal for myself and (hopefully) help other people in their journey too. Feel free to comment on my posts or contact me, especially if you have anything you would like to ask that I blog about. There are few things I want more for you than living a life that you’re proud of, Lisa. Isn’t it amazing that out of all the people and places in the world we come across someone else in such a similar situation?! Hope you’ve been enjoying your course so far – I know I have!